We know: the idea that a hot dog is a sandwich is heresy to some of you. But given that the definition of sandwich is “two or more slices of bread or a split roll having a filling in between,” there is no sensible way around it. If you want a meatball sandwich on a split roll to be a kind of sandwich, then you have to accept that a hot dog is also a kind of sandwich. That’s their definition. By my definition, a hot dog is a hot dog. It’s its own thing, with its own specialized bun. If you went in a restaurant and ordered a meat tube sandwich, would that make sense? No! They’d probably call the cops on you. I don’t care what anyone says—a hot dog is not a sandwich. And if hot dogs are sandwiches, then cereal is soup. Chew on that one for a while. Read broadly, this definition does not exclude cold cereal from being a type of soup. Cereal is a liquid food containing pieces of solid food. It doesn’t have a meat, fish, or vegetable stock as a base, but the definition doesn’t strictly require that. But we all know, of course, that cereal isn’t soup. Soup is usually (but not always) served hot, and it’s usually (but again, not always) savory or salty. It’s also usually eaten for lunch or dinner, while cereal is usually eaten for breakfast. But note how hard it is to write a definition that includes all things that are soup and excludes all things that aren’t. I wouldn’t put it that way, but, with apologies to my good friends at Merriam-Webster, I do think this is a case of reasoning from the definition. Lexicography’s primary aim is to describe how people use words, and people simply don’t use the word sandwich to refer to hot dogs. If someone said, “I’m making sandwiches—what kind would you like?” and you answered, “Hot dog, please,” they’d probably respond, “No, I’m making sandwiches, not hot dogs.” Whatever the history of the term, hot dogs are not considered sandwiches anymore. Use determines the definition, not the other way around. And definitions are by nature imperfect, unless you want to make them so long and detailed that they become encyclopedia entries. So how can hot dogs fit the description of a sandwich but not be sandwiches? Easy. I propose that sandwiches are a paraphyletic group. A monophyletic group contains all the descendants of a common ancestor, but a paraphyletic group contains all descendants of a common ancestor with some exceptions. In biology, for example, mammals are a monophyletic group, because they contain all the descendants of the original proto-mammal. Reptiles, on the other hand, are an example of a paraphyletic group—the common ancestor of all reptiles is also the common ancestor of birds and mammals, but birds and mammals are not considered reptiles. Thus a chart showing the phylogenetic tree of reptiles has a couple of scallops cut out to exclude those branches. Foods may not have ancestors in the same sense, but we can still construct a sort of phylogeny of sandwiches. 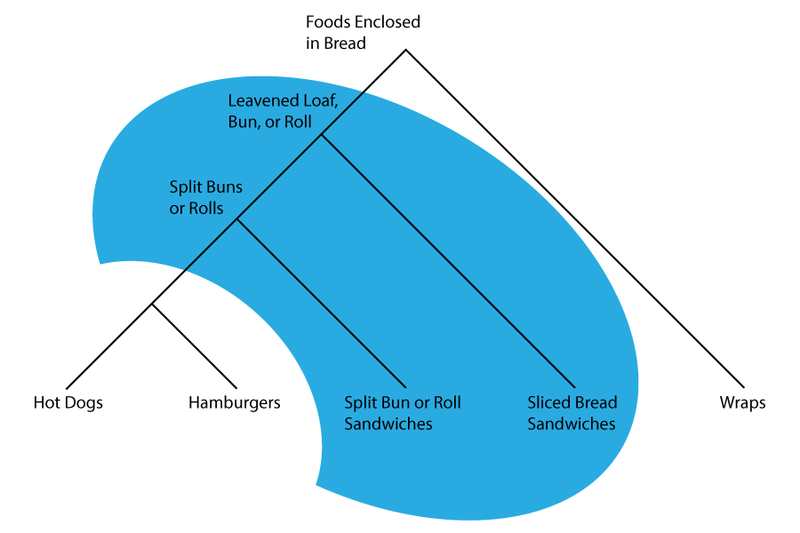 Sandwiches include at least two main groups—those made with slices of bread and those made with a split bun or roll. Hot dogs would normally fall under the split-bun group, but instead they form their own separate category. Note that this sort of model is also quite flexible. Some people might consider gyros or shawarma sandwiches, but I would consider them a type of wrap. Some people might also consider hamburgers sandwiches but not hot dogs. Sloppy joes and loose meat sandwiches may be edge cases, falling somewhere between hamburgers and more traditional split-roll sandwiches. And in some countries, people might also say that the split-bun types aren’t sandwiches, preferring to simply call these rolls. Wherever you draw the line, the important thing is that you can draw the line. Don’t let the dictionary boss you around, especially on such an important topic as sandwiches.